By Application only & strictly limited availability – There are over over 400 active delegates within our VIP Community who’ve bought a combined portfolio of over £400,000,000. Yes, thats £400Million. It’s now the largest UK mastermind of active professional property investors of all levels, there to help you build your portfolio and reach your cash flow goals in a supportive and empowering community. Over 20% of the Progressive VIP Community have quit their jobs and have become full-time property investors. Progressive Property VIP Alumni Claire and Mark Doyle share their property investing results and how training with Progressive Property gave them the support and knowledge to accelerate Property as their job replacing income. 12 VIP monthly VIP only webinars with Master Progressive mentor Roy Inman which includes a detailed Q&A. Some of the most active VIP Community Members have multi-million pound portfolios with between £3,000 and £10,000 net cash flow per month. 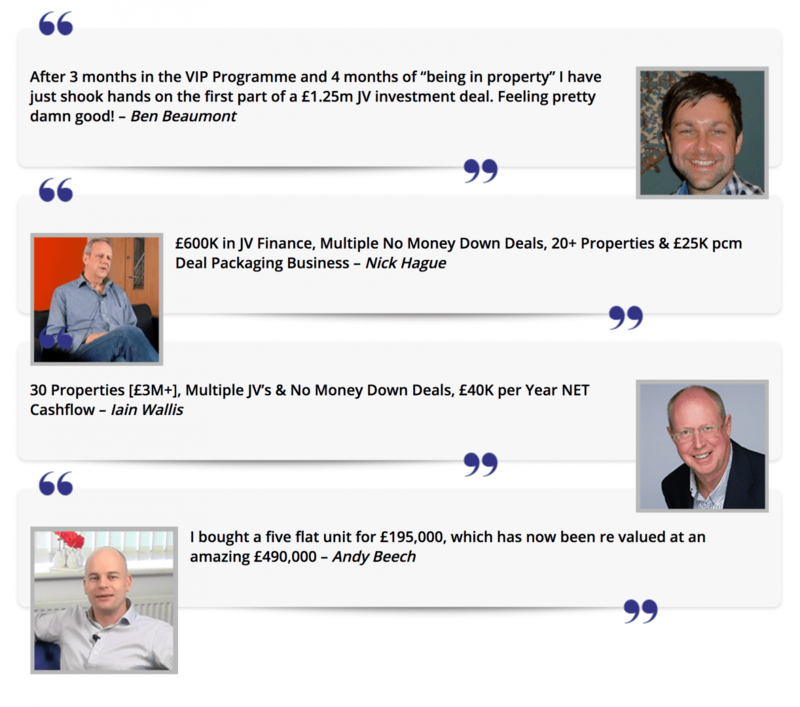 Many Progressive VIP Members past and present are now UK property experts in their own rights, running their own training programmes, portfolio building and deal packaging businesses and mentoring others. We keep them, and you, accountable to success. £65million of joint-venture [JV] finance has been raised and exchanged within the Progressive VIP Community, which you can instantly tap into. Just imagine what these or similar results could do for you and your life. The Progressive Property VIP Programme	Overall rating:	5	out of 5 based on 4	reviews.